The pyruvate dehydrogenase complex was deleted to increase precursor availability in Corynebacterium glutamicum strains overproducing l-valine. The resulting auxotrophy is treated by adding acetate in addition glucose for growth, resulting in the puzzling fact of gluconeogenic growth with strongly reduced glucose uptake in the presence of acetate in the medium. This result was proven by intracellular metabolite analysis and labelling experiments. To increase productivity, the SugR protein involved in negative regulation of the phosphotransferase system, was inactivated, resulting in enhanced consumption of glucose. However, the surplus in substrate uptake was not converted to l-valine; instead, the formation of up to 289 μM xylulose was observed for the first time in C. glutamicum. 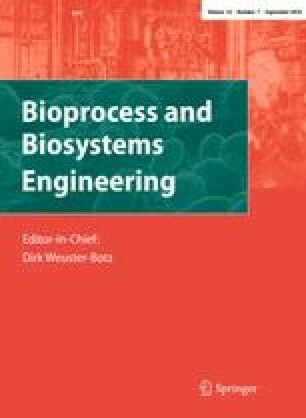 As an alternative to the genetic engineering solution, a straightforward process engineering approach is proposed. Acetate limitation resulted in a more efficient use of acetate as cosubstrate, shown by an increased biomass yield Y X/Ac and improved l-valine formation. This work was financially supported by the Fachagentur Nachwachsende Rohstoffe of the BMVEL—Federal Ministry of Food, Agriculture and Consumer Protection—(grant 04NR003/22000304) and by Evonik Degussa GmbH. The authors wish to thank Verena Engels from IBT 1 of Forschungszentrum Jülich GmbH as well as Robert Gerstmeir and Andreas Karau from Evonik Degussa GmbH for fruitful cooperation and the valuable discussion of results, and Pia Makus for her assistance in performing the experiments.